A stunning twin Chinese Sweet Plum (Sageretia theezans) bonsai, signifying new life, renewal and creativity. This is an incredibly characterful variety of indoor bonsai, where its flaky bark reveals beautiful tones of red and tan. The elegant foliage displays a graceful transition from a shade of rusty-red into a glossy and vibrant green. An ever-changing work of art, these bonsai become embellished with delicate white flowers which, in turn, give rise to tiny plum-shaped fruits. 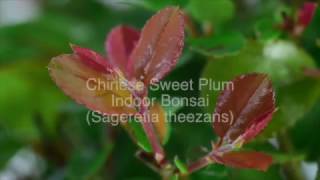 Two well aged Sweet Plum bonsai with immense character with delightful variation in shades. These bonsai stand together harmoniously to give a peaceful yet powerful visage - lovely idea for a wedding anniversary or wedding gift - 2 well established bonsai trees in harmony with one another. Chinese glazed temple completes this beautiful composition in contemporary black ceramic pot with matching drip tray. Please select your delivery date on the calendar at the checkout. FREE delivery is available to most of the UK. This is a lovely artistic and highly refined twin trunk bonsai which displays lovely red tones to the new foliage tips. * Pot details: Black glazed rectangular ceramic bonsai pot.